Apart from the delightful little Mi, Myryad's products fall into two visually coherent series, the MX and the Z. 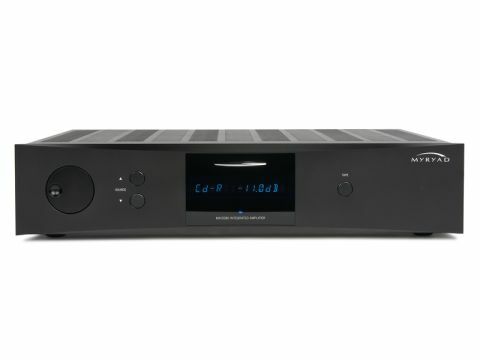 The MXI2080 is one of two MX integrated amps, the other being a 150-watt model in a considerably taller chassis. To all intents and purposes, the specification suggests a perfectly typical integrated, with eight line inputs and two recording outputs. There is also a preamp output and, on closer inspection, it transpires that this unit is really a preamp and power amp in a single chassis. With ever more integrated amps featuring separable sections, the distinction between integrated and pre/power is pretty blurry these days, but Myryad has made the break complete by giving each function its own mains transformer. What's more, there is no internal connection between pre and power sections: instead, one must link them externally using a couple of short jumper wires (supplied). There's a spare output for each preamp channel to facilitate bi-amping. Indeed, the power amp very nearly qualifies as dual mono, since each channel is a physically separate module fed from its own winding on the large mains transformer. All this makes the amp unusually well qualified for stepwise upgrading. Build quality is very good throughout, using a mix of through-hole and surface-mount components. The preamp board selects inputs via relays and adjusts volume with a good-quality electronic control. Myryad has made the most of the system, offering input trim and balance control – other user options include renaming the inputs. Volume steps are 0.5dB. As in many current amps, the mains switch is at the rear and standby is activated by touching the silver protrusion above the display - disconcerting if one does it by accident! This was yet another amp to cause some disagreement among our listening panel. Again, though, there is some logic behind the differing comments. The two listeners who basically liked it commented on aspects such as the airy quality of the sound, clearly meaning that in a complimentary sense as in a feeling of air around the performers. The third, though, clearly found this very characteristic a curse rather than a blessing and would evidently have preferred a more solid-bodied account of the music. But if your tastes run more to upper midrange clarity and sweetness, you may well find much to appreciate here. Even the bass, in fact, which while not at any stage described as particularly full or deep was nevertheless found to have plenty of energy and definition to it. Where this amp really excels, though, is with delicate sounds in the upper octaves, which sing out beautifully and then decay naturally into ambience. Not surprisingly, it made it a good match with Miles Davis on Kind of Blue, where much of the solo trumpet work is quite restrained. It was easy, through the MXI2080, to hear each note starting and then later dying away, while the percussion behind was also precise and almost tangible. Dynamics were good here too, especially 'microdynamics', the little changes from note to note or even within one note that do so much to keep music alive. At the other extreme of scale, the Rachmaninov showed that this amp can maintain a clear and stable stereo image across a wide range of frequencies. The deepest bass lacked something in comparison with some other amps, but not in a way that stands out. The baroque chamber ensemble was precise, too though this proved unexpectedly sensitive to the lack of deep bass, which robbed the harpsichord of some resonance.